Do planners have a place in current social movements? How do your personal experiences shape the way you approach planning related work? Come dialogue with APA’s Young Emerging Planning Professionals Group to discuss how we can use our place in Planning (public, private, non-profit etc) to help push forward social change. Non-APA members welcome/encouraged to attend! This event will also help to kick off the #IAmPlanning social media campaign during the month of October (Planning Month). 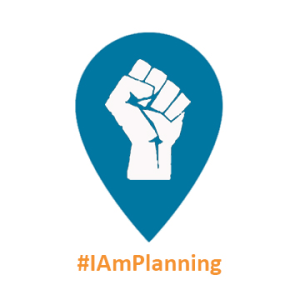 We would like Next Generation Planners from all backgrounds take pictures with a sign that says “I am planning because __________ “. They can fill in the blank with whatever they feel reflects why they are “planning”. For example, a sign may read “I am planning because I want to fight for my community” You would post the picture to social media using the hashtag, give an explanation of my picture in the caption, and tag a friend to take part in the campaign as well. We hope that this campaign with allow us to showcase just how diverse planning is and provide a glimpse into the many reasons why people come to our profession. Parking/Transit Information: On-Site/Street Parking Parking. Very close to USC/Expo Line.